If you don't see your model number, don't give up! Not all model numbers are in our database. 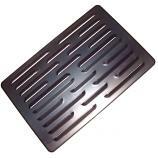 Please view all parts currently available for BBQ GRILLWARE, listed below by part type. Still no luck? Contact us - we're here to help! Search for exact fit repair parts using your model number or part type. USA-Made Burner, Stainless Steel | 16-1/2" x 6-1/8"
BBQ Grillware Heat Plate, Stainless Steel - 16-1/8"
Cooking Grid Set, Porcelain-Coated - 15-1/2" x 23-1/2"
Cast Iron Cooking Grid Set - 17-3/4" x 34-1/2"
Cast Iron Cooking Grid Set - 17-3/4" x 23"